Born Newton Edward Daniels in Southbank, Middlesbrough; the son of a cinema projectionist, Paul's interest in magic began at the age of 11, swiftly developing into an intense, lifelong study of the art. Whilst honing his magical skills, he began work as a junior clerk for his local council, followed by national service in the army. On being demobbed, he trained as an accountant before settling for a while to help his parents in their grocery business. Working semi pro around the clubs, he formed a double act (The Eldanis' an anagram of his surname) with his first wife, Jackie (with whom he had three sons; Gary, Paul and Martin, the last of which was to follow his father into the GOWR). As a solo act, the turning point came when, in 1969, he was offered a summer season in Newquay, followed closely by an appearance on ITV's 'Opportunity Knocks', wherein he was placed second. This led to regular spots on Granada TV's 'Wheeltappers and Shunters Social Club' and further television engagements. He met his second wife, Debbie McGee, during a summer season in Great Yarmouth when she was engaged as a dancer. They married in 1988, but she became well known as his permanent assistant in the act, known popularly as "the lovely Debbie McGee". Numerous engagements included appearances for Royalty and his own 'It's Magic' stage show at the Prince of Wales Theatre in London's West End, which ran from 1980 - 82. 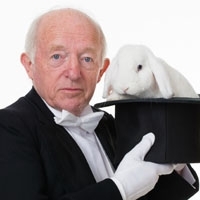 Paul became known for his catch phrase "You'll like this, not a lot"
He was the recipient of many awards including Magician of the Year 1982 from the Academy of Magical Arts (the first magician outside of the USA to receive it). He also won the Golden Rose of Montreux (1985), The Maskelyne from The Magic Circle (1988) and the Lafayette Award from the Edinburgh International magic Festival (2011). Paul also built a name for himself as a host of TV quiz shows; 'Odd One Out', 'Every Second Counts' and 'Wipeout', as well as the children's TV, show 'Wizbit'. In later years, he and Debbie appeared on various reality TV shows such as 'The Farm' and 'Wife Swap'. His autobiography, 'Under No Illusion', was published in 2000. Paul was King Rat of the GOWR for 2 years running; 1995 and 96.